Te Papa’s curator of terrestrial vertebrates Dr Colin Miskelly tells the fifth part of the unfolding story of the emperor penguin that went where none had gone before (at least in the age of digital media). Colin accompanied Department of Conservation staff to Peka Peka Beach on the morning of 21 June, and identified the bird just before the first journalists and media photographers arrived. He is also a member of the committee advising on the care and rehabilitation of the bird, and told the first four parts of its story in Te Papa blogs posted between 23 June and 11 July. It is four weeks since the emperor penguin was taken into care due to concern at his deteriorating condition and the large quantity of non-food items that he had consumed. In addition to beak fulls of sand (believed to have been mistaken for ice, and therefore consumed in an attempt to cool down and rehydrate), the bird had also been seen swallowing driftwood. The veterinary team at Wellington did a great job of removing the sand and small bits of driftwood. It is assumed that he regurgitated the larger bits of driftwood himself on the beach, as these were not found in his system after arrival at the zoo. But once the x-rays revealed that his alimentary tract was sand-free, they revealed another surprise – a large mass of small stones. But Peka Peka is a sandy beach, so where did the stones come from, and why were they there? Penguins catch food by diving, and the added weight may improve their energy efficiency by making them neutrally-buoyant at a shallower depth. The catch is that they would then need to actively swim back to the surface (expending energy), rather than floating up, and a bird the size of an emperor penguin would need to swallow several kilograms of stones to make any difference. Penguins don’t have teeth (another reminder that they are not human), and may use stones to aid the physical break-up of food in the gizzard. All penguins are capable of surviving fasts of weeks, or even months, in duration – up to 4 months for an incubating male emperor penguin. Having a gut part-full with stones may assuage hunger pangs, by triggering stretch receptors in the gut wall, thereby ‘tricking’ the brain into believing that the stomach is not empty. 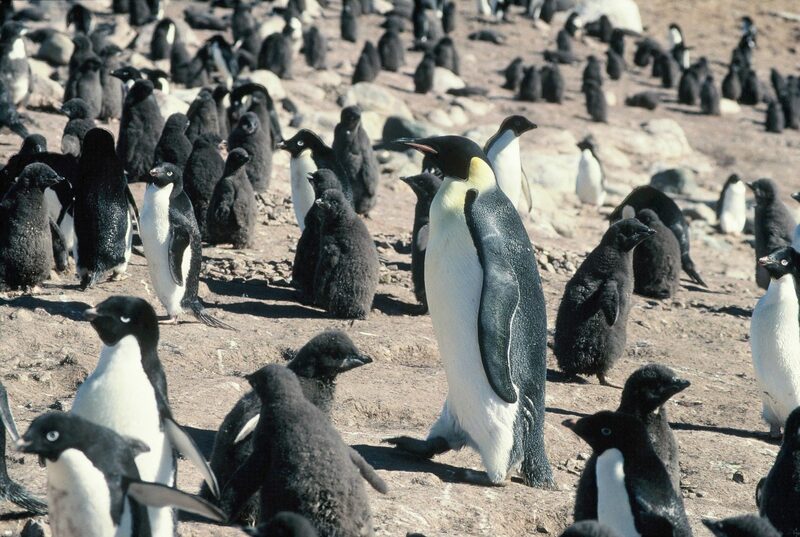 Many penguins have large numbers of gut parasites, particularly nematode worms. The stones may create a harsh physical environment to either kill parasites or make the stomach a less pleasant place to live. Maybe penguins swallow stones because they are already inside their fish prey. An intriguing variation on this is that they may mistake sinking stones for diving fish, if stones fall out of the bottom of melting icebergs formed from glaciers that have picked up rocks from the Antarctic continent. The jury is still out on why penguins swallow stones, but there is ample scope for some nifty experiments to test each of these theories. If it is assumed that emperor penguins deliberately swallow stones, another intriguing question is where do they get them from? 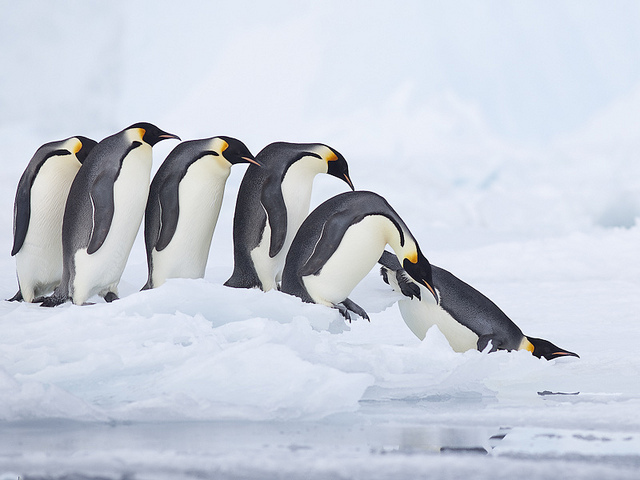 Emperor penguins breed on fast-ice, a term used to describe floating ice that is anchored to the Antarctic coastline (as opposed to the free-floating pack-ice). With the exception of the occasional ablated meteorite, fast-ice is notably free of rocks, adding to the intrigue of where the stones came from. Emperor penguins do occasionally come ashore on ice-free sections of the Antarctic coast, but it is more likely that they pick up stones from the sea-floor – they are capable of diving to over 500 metres. Most of the ocean between Antarctica and New Zealand is thousands of metres deep, and so the stones inside the penguin that came ashore at Peka Peka may yet be able to tell us part of the story of where he came from. But the story could be more complicated than that. The stones might tell us where his parents used to forage, as emperor penguin chicks are known to get stones along with regurgitated food from their parents. Again, we do not know whether this is incidental, or whether the adults are deliberately passing on a geomorphological mouthful that will benefit their chick. Te Papa's BlogThe global penguin – Part 9. Heading home, or heading east? This is all good news (prt1 -5)and I just want to see Happy Feet has got back to his environment safely. It appears that only the best is being done for him. Exactly. I know about the costs of nautical projects. Sometimes reaching their limits human beings should let things go and sometimes this is the best. Happy Feet was’nt born to live in a small room. At present he is the veterinary’s patient and in the future he’ll be what he’s been before: One of thousands of penguins sliding through the water as swift as an arrow. I associate him with wild horses living in freedom but with the risk that eg. sometimes whole herds of them are killed by lightning. I absolutely trust in the expert’s and veterinary’s competences and I will wait and see. Dr. Miskelly, thank you for informing us about the stones in the penguin’s stomach. If they don’t slow him down too much (or cause him to sink) maybe they won’t need to be removed. For what it’s worth, I realize that wildlife and zoo officials have other animals to worry about, and I have been following the plight of the prions as well. As you can see from my earlier posts, I am concerned about all animals in distress, not just this particular penguin. Cost is certainly a factor to be considered, and I hope that donations can be obtained for the care of the prions, etc. as well as the penguin. As you have pointed out earlier, this penguin has an international following, so I am guessing that tourists and news media would pay a considerable amount of money to be on the ship that drops off the penguin, thus alleviating much of the cost. Thanks very much for all your time and expertise in this matter. It is unclear whether any stones came out along with sand and other detritus when the penguin was first operated on. Once I became aware of the stones in the x-ray, I asked the zoo veterinarians to keep a sample for geological analysis, but so far the bird has not regurgitated any. 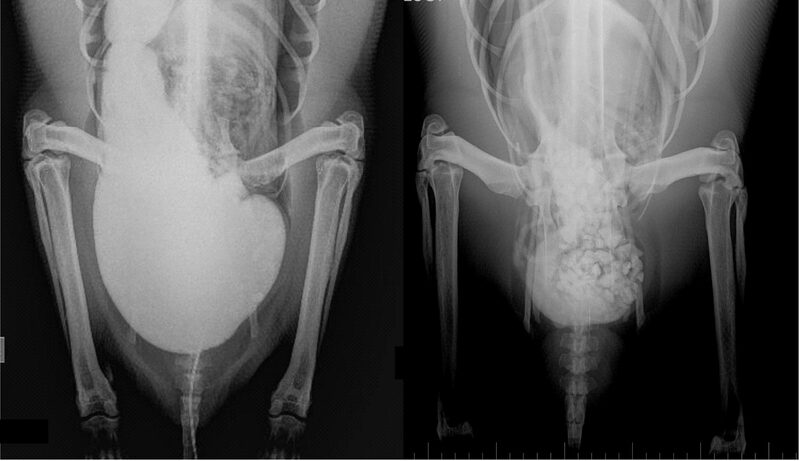 He may be operated on again specifically to remove some of the stones, but this intervention needs to be weighed against the fact that healthy penguins often do have a lot of stones in their stomachs. Depending on the vessel chosen to release the bird, every degree further south is likely to cost tens of thousands of dollars. Is this justifiable, when there are an estimated 400,000 healthy emperor penguins? Thanks very much, Antje. I agree with nearly all of what you’ve said, especially the part about guarding him like a prisoner. I hope that doesn’t go on too long in his present situation. I also agree that he is a strong swimmer, as evidenced by the fact that he made it this far in the first place. I wasn’t recommending releasing him in a penguin colony; only in open water a bit closer to home. But you have a point that this approach might be more disorienting than a local release. It’s possible that he knows how he got to NZ and can find his way back. I certainly hope so anyway. Does anyone have records of how/where the 1967 penguin was released? But without a tracking device, they probably had no idea where he ended up. As for the posting-time confusion, of course you are right. I was aware of NZ time but was just mis-reading the a.m. and p.m. part. (It’s been a long, hot, exhausting day.) Thanks for straightening it out. I’ll check out the divingphysiology website. Thanks again! Back to discussion: I’m not so much worried about Happy Feet. It’s not proved that he’d lost orientation. Perhaps he’s just a little adventurer who’d reached his limit at eating sand and nothing else. If I could make the decision (you are allowed to blame me for that) I would throw this bird as soon as possible back into the water, into his natural habitat, being almost certain that he will make his way home. Muscletraining: As I mentioned on Wellington-Zoo-Facebook-Page, penguins need streamline to move. As a matter of fact they achieve streamline in eating much food and getting a fat belly. They’re perfectly shaped for sliding through the water meeting almost no water resistance. Perhaps Colin Miskelly will correct my layman’s knowledge I just got by Internet during the last weeks, eg. at the website (spelled because otherwise it’s mistaken as “spam”-comment): “http://” without “www” “divingphysiology dot wordpress dot com slash tricks-of-the-trade slash” (of course all without those quotation marks). Releasing him 1000 km further to the south: In case he’d lost his orientation he would travel north again or west or east but not south. So releasing him to the ocean of course is a well-calculated risk that he (and we) have to stand if we really want him to be free. Living free has its price, that’s living risky. And releasing him at some penguin’s colony could be wrong as it’s possible that they won’t adopt him but will hash him up. By the way they won’t intervene if Happy Feet would run into problems unless otherwise he’d be stranded in New Zealand again. I think this is ok. Thousands of young penguins don’t survive their first years of their lives. The biggest mistake that could be made would be to guard him like a prisoner or like a kind of “baby” because it could be that as a matter of fact he just is a high-performance-swimmer needing nothing else than freedom. Something is wrong with the date and time of the above postings. For the record, the above post beginning with “I came back…” was written about ten hours later than my two earlier posts. I came back to this site hoping to edit or delete my previous post, but cannot find a way to do so. Although I continue to be frustrated by the term “natural event” as an excuse to do nothing when an animal needs help, I do not wish to make accusations against the people responsible for the NZ Emperor Penguin. 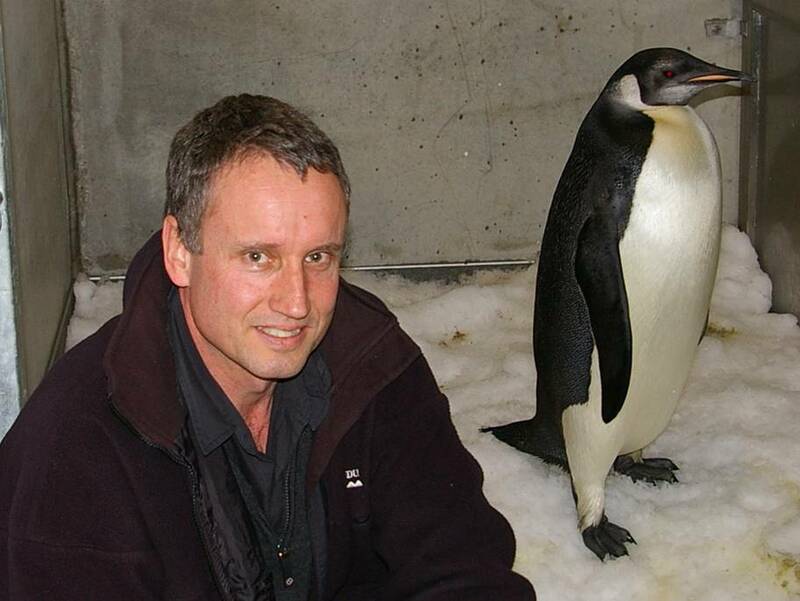 I think it’s clear that the staff at Wellington Zoo are doing everything in their power to help this antarctic bird, and I am hopeful that the wildlife experts who are planning the penguin’s release are doing the same. It does seem somewhat miraculous that the penguin managed to avoid predators and survive the 2,000 mile swim from Antarctica to New Zealand. His sense of direction may be imperfect, but his physical fitness certainly cannot be criticized. I hope he will be given every opportunity to continue that miraculous survival story by making his way back to Antarctica. But that may be the whole point. Currently, he is being fattened up but given absolutely no exercise. I am beginning to suspect that wildlife experts are hoping he’ll be devoured before he can reach Antarctica, even though he has been in quarantine for a month now and shows no apparent signs of illness. Forgive me if I seem a bit callous, but I live in the USA, and we are constantly hearing that we must not interfere in “natural events” for animals who, due to human effects, are no longer living in natural circumstances. If a bison falls through the ice in Yellowstone Park, we are told that we cannot interfere because it is a natural event — never mind the fact that bison have been chased out of every environment outside of the partk. If a whale is tangled in kelp, we are told that we cannot interfere, even though shipping lanes have altered the whale’s swimming routes and phosphates have probably altered the kelp growth. The term “natural event” is beginning to ring sour for me in a world where even the climate is being altered by humans. I do, however, understand the need to protect the shipping crew from danger in extreme sea conditions. Your blog shows a photo of the stones that were found in Happy Feet’s stomach, but does not let us know whether all or some of those stones were removed. You did mention analysis of the stones, so I’m assuming that at least some of them were removed, but can’t confirm that. I would think that a small number of pebbles would aid in digestion (as other species of birds ingest gravel) but a bellyful seems like too much, so I’m hoping that some were removed. How long do they retain the stones? Did Happy Feet eliminate them in the meantime? I imagine that some little stones don’t effect penguins diving deeper. As some flying birds also eat stones in order to mill their food, I think it’s the same cause of penguin’s behaviour. Perhaps Happy Feet took the stones at another beach of New Zealand or could it be that he took the stones at the antarctic, retaining them over the entire trip to New Zealand? Or is it possible that he was just very hungry but too weak to hunt for fish or other well-tolerated food?